Gonzo – San Jose, CA – Foster Home Urgently Needed | Bull Terrier Rescue, Inc. 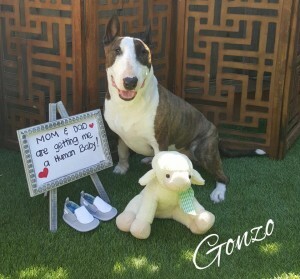 The arrival of a baby proved to be bittersweet for Gonzo’s family. This 7yo guy adores the baby and always brings his toys and gently places them down next to the baby. When the baby developed rashes, it was determined that he was allergic to dogs and cats. Gonzo had to spend his days in the yard and his nights in the garage. He was getting depressed so he would spend a bit of time with relatives and friends but his owner wants him to have a stable schedule and not very people get the nuances of the breed. His best friend is the neighbors English Bull Dog and the 6 and 8yo nieces in his family. He likes to chase the neighborhood cats out of his yard. Gonzo is about 50lbs; and he is obedience, house, crate and leash trained. A foster/foster-to-adopt spot (even an interim one) is needed within the next week as the baby seems to be developing respiratory issues. If your information is not yet on file, please complete online application (http\://www.bullterrierrescue.org/?page_id=572). Please contact Suz at suz@bullyhaven.org or 415-672-7391 if you have any questions about this sweet guy. This entry was posted in Available Dogs, Available Males, Dogs Needing Foster Homes, Waiting In The Wings by Susi Ming. Bookmark the permalink.